A few biased thoughts from a pastors wife! A normal day..... what.... do they exist in ministry? Of course not! This job is not for the faint of heart. It is not for the "must have a consistent schedule" people. It is a tough job, but its more than a job, it is a calling. "The ideal pastor preaches exactly twenty minutes with an hour's content. He condemns sin, but never offends anyone. He works from 8 am to midnight, and also serves as the church janitor. He makes $40 a week, wears good clothes, and donates $30 a week to the church. He is 29 years old and has 40 years of experience. He is a strong leader, yet also follows everyone's advice. He can effectively relate to all teenagers and spends all of his time with the elderly. He is tall and short, thin and heavyset, and has one brown eye and one blue eye. He makes 15 house calls a day, regularly visits the hospital, and is always in his office." Oh and don't forget their perfectly behaved children that sit quietly in the pew every Sunday. Though this is humorous, you would be amazed at how many people have some of those exact expectations of the pastors.... I especially love the "is always in the office". Don't get me wrong it is good to have some office time, and sometimes you need to have a lot of office time. But if you are in the office all the time you aren't out with people, you are aren't doing life together with your congregation. The perfectly behaved children.... yeah, my child is just as squirrely (if not more) than the non-pastor's child that is sitting near us. My child spends a lot of time at the church, so it makes sense they may be more familiar with all the good hiding places :) But know that just like most other children, my girl loves her Daddy and when she sees him, even if he is up front, she wants to say hello and give him some love.... or just talk in the microphone. Give her grace, it is a challenging job to live up to the expectations of being a PK. I am thankful for two pastors that are out of the office as needed, visiting with people, doing life with others. I am thankful for pastors who are willing to serve despite their paycheck. I am thankful for pastors who go out of their way to relate and love on "the least of these" Thank you for loving your families and modeling that to the congregation. Thank you for your time and your sacrifice. 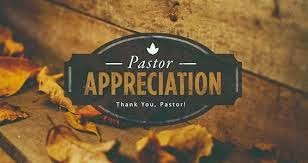 I pray that we as a congregation at our church and the church universal would take time not just this month but every month to encourage their pastors! 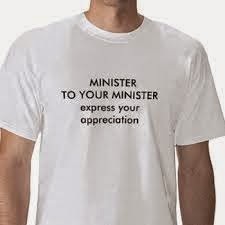 I have spent many years working in ministry.... as a volunteer, staff member, and as a full time paid director. I have worked at camps, churches, and at parachurch ministries. All this to say I have experienced a large variety of ministry settings, but nothing really compares to being a pastor's wife and raising a child in the pastoral setting. As a wife of a pastor I see the amount of time and energy my husband puts into his ministry at the church. I hear the phone ring as soon as he walks in the door for the one more problem to solve or one more detail to figure out, or to find out that he needs to head out the door to do an emergency visit. I see his love for the church, I see his hurt for the church and its people. My downfall as a pastor's wife is that I often feel that our staff is under appreciated, some people are more quick to complain than they are to encourage..... it is just a small portion but sad to say it is the negative words or criticism that you remember. Please here me say, I love our church and I am so grateful for a healthy church that is active and encouraging! I just think it is important for people to better understand the time and commitment it takes to lead a healthy church. And how ministry affects the whole pastoral family. I know what it feels like to be a PK - I was one.... I was a Principal's Kid.... which in many ways is like being a pastor's kid.... but in many ways very different. It is often easy to critic those that are up front and in leadership, as a child I heard those words and it hurt me to think someone didn't appreciate the sacrifices that my dad was making for our school. For Ella and other pastor's kids, it will hurt them just the same. They will grow up feeling a bit of pressure (though not intentional I don't think) to be perfect (the same feeling we as pastor's wives struggle with) We know that people are watching how we lives our lifes, they are watching how our kids behave and they are watching how we show and receive love. Whether we like it or not we are in the lime light at the church. It reminds me of the passage that says, "to those who are given much, much is expected" I know as a pastoral family there are great expectations, to which we strive to live up to, but also know that we will fall short, and to that we need your grace and mercy so we can pick up and start again. I am grateful to have another pastor's wife in our church. One that can be a sounding board, and one to walk the ministry road with. Thank you Nicole for being a great friend! I love being in this ministry journey with your family and I can't wait to see how God uses our husbands, us, and our children to do great ministry in our church, our community and our world. Take some time this week to love on your Pastor's wife and children, they need to know their sacrifices and time are worth it! To spread the message of "GOD'S LOVE". She was hand picked too. and Help him just the same. Have you ever heard the saying, if you find the perfect church, don't join it because you will surely mess it up! Kinda funny but oh so true! There is not a perfect church around..... but there are lots of great churches, that seek to draw people to Jesus, to challenge you in your faith and provide an opportunity to Worship the King of Kings all that while staying true to God's word. Our church is not perfect..... our church is group of people all ages, all styles, all financial backgrounds, ecclectic as my husband would say.... a church filled with people doing life together, learning daily to surrender and be obedient to God. I love that our church is growing, we have new families and new babies almost monthly - something to be excited about for sure! God has been blessing our church.....in the midst of that blessing, we have had our share of struggles and trials, but we have faced them head on.... and that is my appreciation post for today. I have been apart of many churches through out my years of life, and I have never seen a staff and leadership team that is so willing to deal with conflict, instead of running away. We have a great team of leaders and pastors that seek to deal with conflict biblically....though not perfect (just like our church) they seek to bring resolve even in the most challenging cases. They encourage the believers to talk to the person in which they have conflict with.... but not only do they encourage us to do that but they model it themselves. 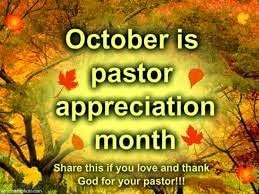 Thank you pastors and church leadership for all you do! Being a pastor's wife I see the amount of time that my husband puts into the ministry that God has called him to..... it seems as though being a pastor can sometimes be a thank less job. They work countless hours each week.... taking one day off (though they both have worked on that day when situations arise). They miss time with their families to serve the church family. They work late at night, early in the morning as they fulfill their call. They sacrifice their own time for the sake of the church. Thank you!!! Thank you!!! Thank you!! Take some time this week to actually call or send a letter or card of thanks to your pastor. Take them out to lunch, offer to help them with a project at home, give them the gift of family time..... but please in the least say thank you! They love us, they serve us, they mentor us, and they provide great leadership for us. Thank you for loving God's word, for studying it, for praying through it, for seeking God's wisdom to understand it. It is a blessing to be under your leadership and to be able to benefit from your time of study. Thank you for being a great example for all of us. We appreciate your excitement and enthusiasm as well as your ability to confront and deal with conflict. Thank you for all you do that no one sees. You are a gift to our congregation and we appreciate all you do! Thank you for modeling what it means to Love God, Love your Family, and Love the church! You are an amazing man of God. I am so blessed to call you my husband.... but since this is a pastor appreciation letter and not a husband appreciation letter I will focus on ministry stuff. I have never met a pastor who has such great love for his church. You long for the church to reflect God - you love the people of the church. Your longevity at the church is unheard of in a a culture where people run to something new when challenged or hard times come. Thank you for your consistency. Thank you for you gift of compassion. You will talk to anyone at any time, you care about people knowing Christ. You invest in the lives of people.... its not just a church thing for you, it is a life thing, you go and watch peoples games, plays and concerts - not just the youth but others as well. You make countless visits to the hospital, nursing homes, and others to show that we as a church care. You answer the calls in the middle of the night at times of need (at least when you hear them you do :)) You are blessing to our congregation! Your years of service give you wisdom that is a huge asset to the leadership of the church. You are a gift and I love you (oh wait I said that I was keeping this pastor related only!) oh well I can let everyone know I love my Associate Pastor! So today I am thankful for Joel Snyder﻿ and Aaron Benner﻿ and their great relationship with each other. It is so refreshing to see two men that care about each other, not just in work related areas but in life. They work well together, though they are very different, they balance each other out. Over the last year they have taken on a lot being without another pastor and they keep pressing on! They keep visiting, they keep teaching, they keep serving. You sharpen each other Prov. 27:17. Thanks for all you do! Pray for your Pastors and encourage them!